The recent investigations revealed phone contact between U.S. consulate (above) staff in Istanbul and FETÖ figures. 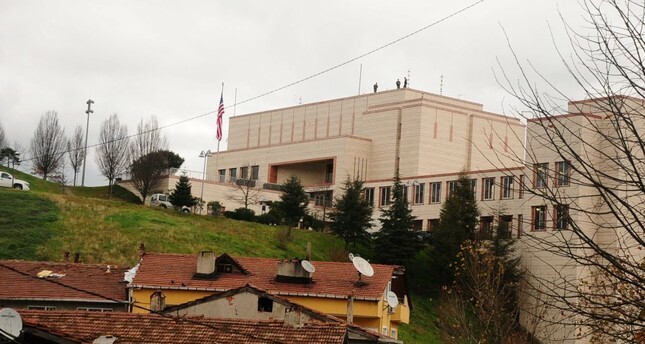 The U.S. consulate in Istanbul is under more scrutiny after it has still not answered questions regarding contact made between its staff members and members of the Gülenist Terror Group (FETÖ). Both the Akşam and Sabah newspapers reported that a Turkish staff member working at the U.S. consulate in Istanbul was found to have links to a number of police chiefs who were behind the two coup attempts by the terrorist group four years ago. The individual, identified as M.T., also made repeated phone calls to 11 members of the terrorist group, from a number registered with the U.S. consulate. According to a report written by Kenan Kıran and Nazif Karaman in Sabah, M.T. (identified as Metin Topuz by Akşam daily), had conversations with Mehmet Akif Üner, Yakup Saygılı, Nazmi Ardıç and Mahir Çakallı, according to phone records. A former deputy police chief for Istanbul, suspected of coordinating the infamous Dec. 17, 2013 operations involving FETÖ-linked prosecutors in Istanbul, Çakallı and other Gülenists members in Istanbul's law enforcement unlawfully detained a number of people close to the government. The incident that took place on Dec. 17 was an attempt to implicate members of the president's Cabinet in a criminal probe. Nazmi Ardıç, then-head of the Organized Crime Unit in Istanbul and Saygılı, then-head of the Department for Financial Crimes, were both arrested for their links to FETÖ. The two men were among the plotters behind the 2013 coup attempt. Üner, another of M.T. 's accused contacts, was the head of the Istanbul Police's Fraud Division during the 2013 attempt. Like M.T. 's other contacts, all were users of Bylock, an encrypted messaging app exclusively used by FETÖ that proves the suspects' ties to the terrorist group. While it remains unclear whether M.T. was detained, according to Sabah's report, M.T. returned to Turkey last month from an unspecified country. A report in the Akşam newspaper says that M.T. assisted FETÖ-linked police chiefs in handing over documents regarding the 2013 police operations to Preet Bharara, a former New York attorney who conducted an investigation into Reza Zarrab, an Iranian-Turkish national who is being held in the U.S. three years after being included in a 2013 probe involving people close to the government in Turkey. This is not the first time that staff members of a U.S. mission are in the limelight for what the Turkish media calls "dubious contact" with FETÖ-linked figures, followers of their self-exiled leader Fetullah Gülen who lives in Pennsylvania. Before Adil Öksüz dumped his cellphone and disappeared, he received one last call from an Istanbul telephone number. It was someone from the U.S. consulate which, according to the U.S. Embassy's claims, called the theology lecturer to inform him that his visa application had been canceled. The call went unanswered and the whereabouts of Öksüz are not known. However, the rest of his story is forcing Ankara to question the motives of the phone call. Öksüz is a senior figure of FETÖ and is accused of masterminding the July 15, 2016 coup attempt that killed 249 people. He was released after his capture at Akıncı, a military base in the capital city Ankara, where coup plotters commanded the takeover attempt. According to investigators, the U.S. consulate placed a call to Öksüz while he was on the run. Meanwhile, government spokesman Deputy Prime Minister Bekir Bozdağ called on the U.S. to clarify the matter regarding Öksüz, "So that there will not be other scenarios being talked about." Strong anti-American sentiments have persisted in Turkey, especially after the coup attempt, with recent surveys showing that social media is awash with comments denouncing the perceived role of the U.S. in the coup bid. Even though conspiracy theories linking the U.S. to past coups in Turkey are nothing new, it is Gülen, the leader of FETÖ, whose stay in the U.S. is fueling rumors. Gülen has been a resident of the country since 1999 and currently lives in a posh retreat in Pennsylvania where he frequently gives interviews to the media. Bozdağ said there were a number of questions that needs to be answered, such as which numbers Öksüz gave when he applied for a U.S. visa and the "issues of whether or not he really applied, clarification and the declaring from [the U.S. Embassy] regarding the documents related to his application." Öksüz was a frequent traveler to the U.S. prior to the coup attempt, often visiting the U.S. on the same day and from the same airport as other key figures later captured at the Akıncı military base; including Kemal Batmaz, an alleged non-military co-conspirator of the coup attempt who worked as an executive for a FETÖ-linked company. U.S. authorities have yet to take steps to extradite fugitive FETÖ leader Gülen, despite appeals by Ankara. President Recep Tayyip Erdoğan has said that Ankara sent "85 boxes of concrete evidence" regarding FETÖ's involvement in the coup attempt to Washington judiciary officials but no steps have been taken to bring him to justice. In another case, two FETÖ figures involved in an espionage case were in touch with the U.S. mission, according to Turkish prosecutors. A recent indictment says two "civilians" from FETÖ who personally oversaw the raid on the trucks belonging to Turkey's National Intelligence Organization (MİT) in 2014, were the same duo that made phone calls to the U.S. mission. The indictment says that Gülen ordered his followers to expose a secret operation by MİT being conducted in southern Turkey. On Jan. 19, 2014, MİT trucks bound for Syria were stopped and searched by FETÖ-linked officials and the raid, conducted in the city of Adana, made headlines as FETÖ spread photos of the raid publically, despite national security laws forbidding the search of the trucks. After Andaç "organized the raid," on Jan. 20 he made three phone calls to a U.S. mission in Turkey. While it is unclear which consulate he called, it is likely that he contacted the consulate in Adana where the raid was executed. Andaç made phone calls again to the consulate on Jan. 21 and Jan. 24. A teacher by profession, Andaç was a high-ranking figure in FETÖ. The other suspect included in the indictment, Muharrem Gözüküçük, a civil servant for Turkey's Labor Ministry, was the "handler" of Colonel Erdal Turna, a senior military intelligence officer in Ankara who wiretapped the phones of MİT staff members and uncovered the secret MİT operation. Gözüküçük phoned the U.S. embassy twice on March 6, 2014, according to the indictment. The calls are highly suspicious, as they were made from cellphones used by suspects only after the raid. Chief Prosecutor İrfan Fidan in Istanbul, who is conducting the investigation in the case, recently, told reporters that they discovered multiple phone calls made a day and two months after the incident by suspects, requesting that U.S. embassy officials disclose the content of the phone calls.